Looking for a small, sturdy bushcraft knife? Something convenient to keep with you on the trail that'll cut through numerous types of materials and hold up for years on end? The RC-3 knife will do exactly that, and more. 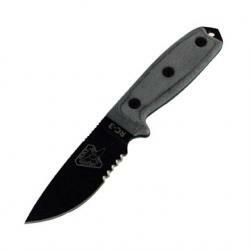 It features a 3.38-inch 1095 carbon steel blade (unbreakable, scratch resistant, and extremely resilient) with a black textured finish. The gray handle is almost 5 inches long and is made from Linen Micarta, a mid-grade material in terms of toughness and durability. And the blade itself (the most important part, of course) features a drop point with full tang construction for quality resilience and strength. You should also know that this is the combo-edge version of the RC-3 blade. It's also available elsewhere with a plain-edge blade, if that's more your style. Comes with Molle sheath and boot clip.